Like granola. Paying $15 for one kilogram of it seems like a lot to me, especially when we plow through a bag so quickly. So I set out to make my own. 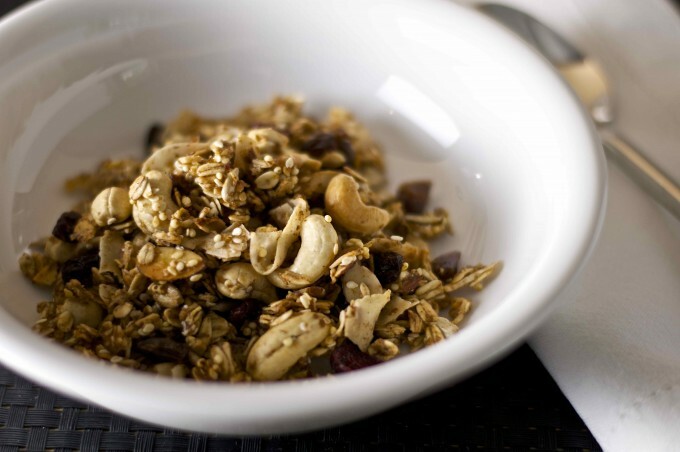 Making granola is a super simple process and doesn’t require any magic ingredients or techniques. Bring together dry ingredients like oats, nuts and seeds, mix in some liquid sweetener (honey, applesauce) to help bind it together, then bake in a low oven until it’s crisp. So easy. My version here aimed to come close to Terra Breads’ artisan granola, an indulgent mix of whole cashews, chewy oats and big ribbons of coconut. The one thing I wanted to change is to make it gluten free (by using gluten-free oats and eliminating any other grains). Ooh la la, it turned out great! It has a lovely crisp-chewy texture, and I think adding in some cinnamon was a brilliant move. It gives a wonderfully cinnamon-y fragrance but doesn’t taste overpowering in the least. The great news is it makes a lot, about 19 cups, or almost two kilograms. That’s enough to sprinkle on Bob’s fruit mountains for more than a week. Whew! So this is granola #1. What would I change in version #2? Hmmm…I think I’d prefer slightly less millet and less sweetener, plus I’d like to have bigger clumps of granola, too. Other than that it’s pretty much perfect granola. And, frugal girl, is it cheaper than store bought? I’ll say yes, definitely. That’s what my intuition says. UPDATE February 8: My intuition was right! The cost of ingredients was $23.99. 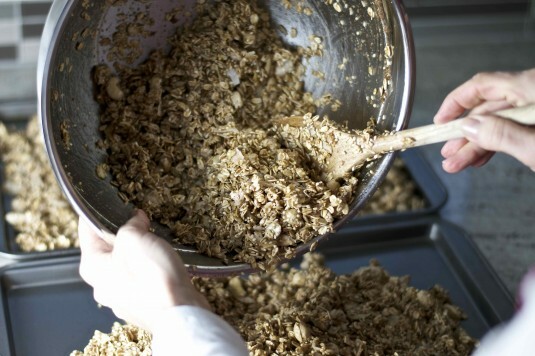 Since the recipe made 1.9 kilograms of granola, it works out to $12.63 per kilogram — almost $5.00 cheaper than the artisan store-bought kind. Yippee! I also updated the recipe with the weight equivalents of each ingredient. 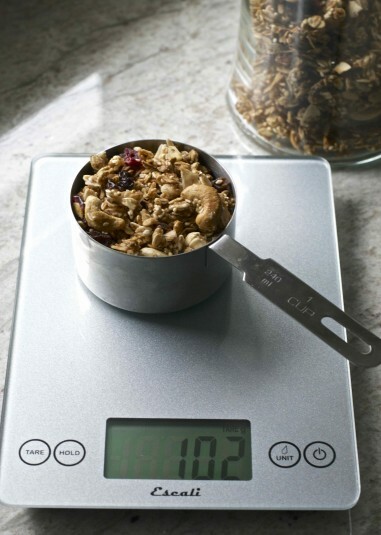 If you have a scale handy, it’s faster (and more accurate) than using volume measures like cups and teaspoons. Made gluten free by using gluten-free oats. This is my attempt at making a luxurious granola with whole nuts and large coconut ribbons, similar to what Terra Breads does with its artisan granola. In a small bowl, soak the millet in 1 cup of water. Set aside. In a large bowl, combine the rest of the dry ingredients -- oats, cashews, almonds, coconut, sunflower seeds, sesame seeds, flax meal, brown sugar, cinnamon and salt. Mix with a wooden spoon until they're combined evenly. In a medium bowl, combine the wet ingredients -- applesauce, 1/2 cup honey and walnut oil -- and stir until evenly combined. Drain the millet, add it to the granola and stir until it's incorporated. Add the wet ingredient mixture into the dry ingredients and stir to coat evenly. Pour the granola out on two large baking sheets. You're aiming to divide the mixture between the two, in a single layer, so that the granola bakes evenly. Place the sheets in the oven and bake for 40-50 minutes until the granola is toasty brown, stirring every 10 minutes to ensure it browns evenly. Remove the baking sheets from the oven, drizzle the remaining 1/2 cup honey over top and let cool. 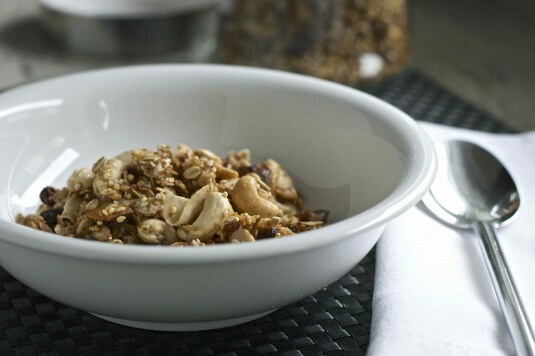 Pour the cooled granola into a large bowl and add the dried fruit. Stir until the fruit is evenly distributed. When I make Granola, which I haven’t in about a year, my recipe calls for 8 cups of rolled oats and only 1/3 cup of maple syrup. I find this plenty sweet enough for me, especially if I’m serving it with fruit. The maple syrup is much nicer than brown sugar, too! We’re just about out of granola, so version #2 is coming soon: Way less sugar (like no brown sugar). 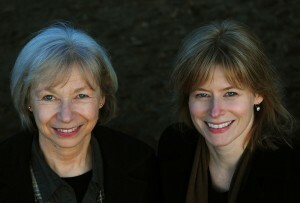 I should try maple syrup too instead of the honey – thanks, Daphne!